Africapitalism is a development model that prioritises our youth and creates hope for them; one that creates economic empowerment and hope for the future” – Tony O. Elumelu, CON. With these words, the 2017 TEF Entrepreneurship Forum officially came to an end on Saturday, October 14, 2017. If Day One was defined by the hopes and dreams of over 1,000 entrepreneurs meeting together―some for the first time―in one gathering, Day Two was about the future and the synergy between the private and the public sectors towards the actualisation of what is now being termed “the African dream”, encapsulated in the philosophy of Africapitalism. 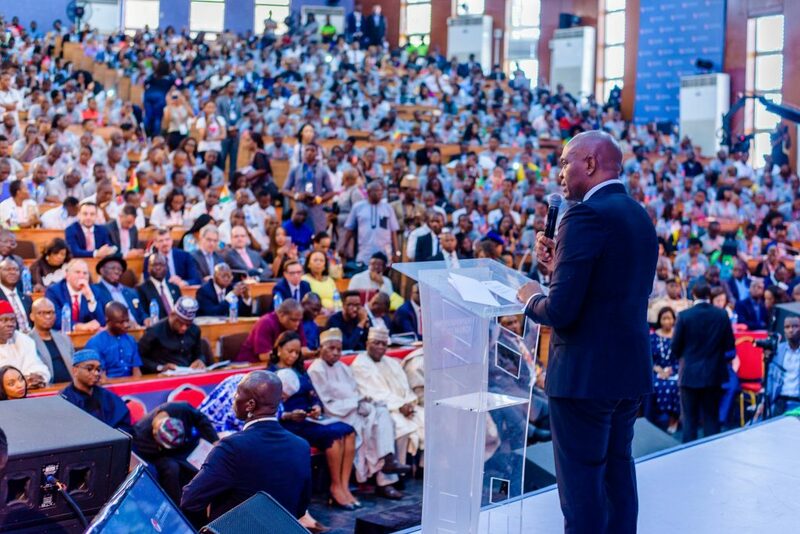 TEF Forum Day 2 began on an energetic note as two of Africa’s finest emotional intelligence and leadership experts, Mr. Maxwell Ubah and Mr. Chike Onyia, took the stage to fire up the crowd in preparation of what would become the highlight of the 2-day event. Afterwards, there was a panel discussion on ‘Changing Africa’s Development Paradigm through Investment & Entrepreneurship’ with Stephen Haykin, USAID Country Director; Lamin Manneh, Director, UNDP Regional Service Centre for Africa; Samuel, Bwalya, Country Director, UNDP; Eloi Filon, Head of Delegation, Red Cross, Nigeria; moderated by Mr. Frank Nweke II. During this panel, Mr. Eloi Filon made an announcement committing $1million to a joint fund with the Tony Elumelu Foundation to help young entrepreneurs in conflict areas in Nigeria and Africa. Next was a panel on the “Capital – Destination Africa; Financing Africa’s future” moderated by Bismarck Rewane with its participants as Wale Ayeni, Regional Head, Africa Venture Capital Investment, IFC; Stephen Tio Kauma, Director & Global Head, Human Resources, Afrexim bank; Heikke Reugger, Mandate Management, Development and Impact Finance, EIB; and Olivier Delfosse, Country Director, AFD Nigeria. The next session was a revealing one as our public and private sector leaders took the stage to debate on the topic “Empowering African Entrepreneurs: Road to 2024”. Moderated by former Prime Minister of the Republic of Benin, Mr. Lionel Zinsou, the panel was graced by HE Aminu Bello Masari, Governor, Katsina state; HE Abdul’aziz Abubakar Yari, Governor, Zamfara state; Oba Otudeko, Chairman, Honeywell Group; and Alhaji Aliko Dangote, Chairman, Dangote group. Finally, the Founder of The Tony Elumelu Foundation, Mr. Tony Elumelu shared the stage with the Vice President of Nigeria, Professor Yemi Osinbajo, to engage with entrepreneurs on the challenges and possible solutions to policy formation and infrastructure that will aid the business environment in Africa. We also had President Macky Sall of Senegal wished the entrepreneurs well and commended TEF on their impact on Africa. Did you miss the highlights of Day One? Click HERE.